In this tutorial we will use the Projections to find the average in Hibernate using Criteria Query. Here we will use the avg() method of org.hibernate.criterion.Projections factory for getting the Projection instance for performing the average on the 'salary" field of 'emp_salary' table. In this example we will use the org.hibernate.criterion.Projections interface of the Hibernate Criteria API which is used to find the average, maximum or minimum values. Our example will return the average of employee salary. After creating the table you should enter few records for checking the example. In this section you have learned how to find the average using the Criteria Query. 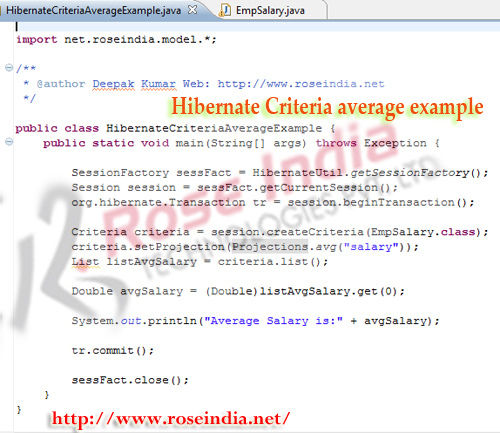 Read more Hibernate Criteria Query examples. Download the Source code of the project discussed here. 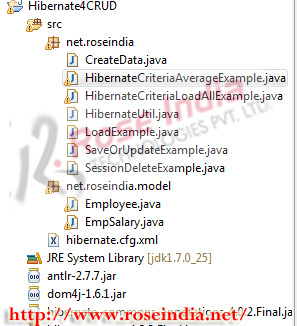 Check more Hibernate 4.2 tutorials.